This Boxer trunk is in a Stretch Cotton. Our Collection at Boxers and Briefs contain only the highest quality DIESEL Mens Underwear. One of our most popular ranges is the DIESEL Fresh & Bright Collection. 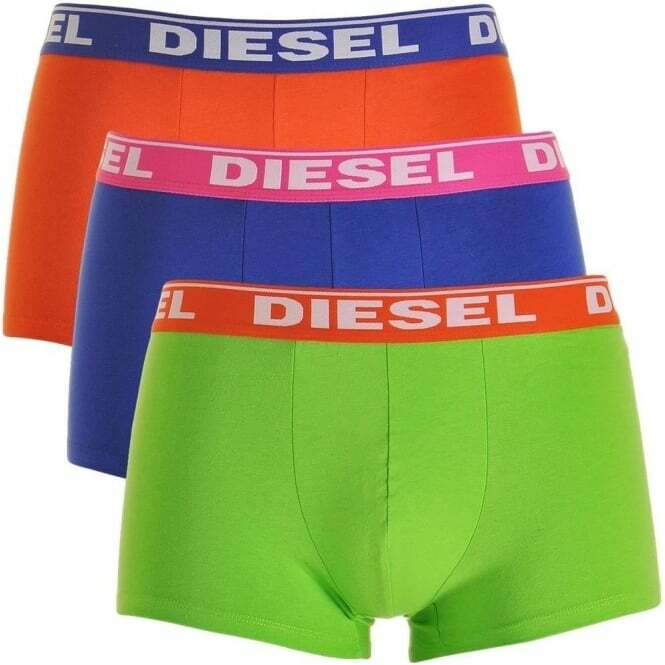 Within this range we have a Orange / Blue / Green DIESEL Cotton Stretch UMBX-Shawn Fresh and Bright 3-Pack Boxer Trunk, which are available in multiple sizes ranging Small to Extra Large. These will be dispatched via Royal Mail International Signed for service at a charge of £7.00. These will be dispatched via Royal Mail International Signed for service at a charge of £11.00. You may able able to return an item for an exchange refund or credit note. All credit or debit card payments are dealt with on our behalf by the specialist professional services of SagePay or Paypal. Paying with Paypal, you are automatically transferred to a secure site where the information you pass is encrypted. In either case, at no time do we see your card details and we do not store any card details. © 2019 Boxers and Briefs. All Rights Reserved.